The Phrenic nerve is a nerve of the thoracic region. It is important for breathing, as it passes motor information to the diaphragm and receives sensory information from it. There are two phrenic nerves, a left and a right one. Both of these nerves supply motor fibers to the diaphragm and sensory fibers to the fibrous pericardium, mediastinal pleura, and diaphragmatic peritoneum. 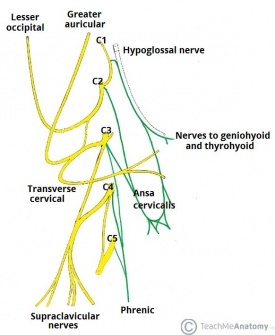 The phrenic nerve originates mainly from the 4th cervical nerve, but also receives contributions from the 3rd and 5th cervical nerves (C3-C5) in humans. Thus, the phrenic nerve receives innervation from parts of both the cervical plexus and the brachial plexus of nerves. The phrenic nerves possess efferent and afferent fibres. 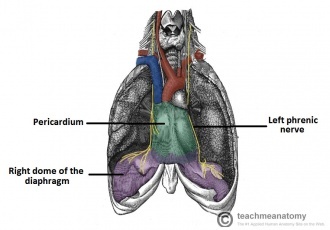 The efferent fibres are the sole nerve supply to the muscle of the diaphragm. The phrenic nerve supplies the ipsilateral diaphragm. The afferent fibres carry sensation to the central nervous system from the peritoneum covering the central region of the under-surface of the diaphragm, the pleura covering the central region of the upper surface of the diaphragm, and the pericardium and mediastinal parietal pleura. Anteriorly : The preverterbral layer of deep fascia, the internal jugular vein, the superficial cervical and suprascapular arteries and, on the left, thoracic duct; the beginning of the brachiocephalic vein. Posteriorly : The scalenus anterior, the subclavian artery, and the cervical dome of pleura. The phrenic nerve may be paralysed because of pressure from malignant tumours in the mediastinum. Surgical crushing or sectioning of the phrenic nerve in the neck, producing paralysis of the diaphragm on one side, was once used as a part of the treatment of lung tuberculosis, especially of the lower lobes. The immobile dome of the diaphragm rests the lung. ↑ 1.0 1.1 1.2 Prakash; Prabhu, L. V.; Madhyastha, S; Singh, G (2007). "A variation of the phrenic nerve: Case report and review"
↑ 3.0 3.1 Loukas M, Kinsella Jr CR, Louis Jr RG, Gandhi S, Curry B. Surgical anatomy of the accessory phrenic nerve. The Annals of thoracic surgery. 2006 Nov 1;82(5):1870-5.